Phoenix park in Dublin, Ireland, covers 1,760 acres and is thought to be the largest municipal park in Europe and boasts landscaped gardens, ornamental lakes and large grasslands. It was traditionally assumed that the park was named after the mythical creature the Phoenix, however it is more likely that the park was originally named ‘Fionn Uisce’ which means clear water and refers to a spring which runs near where the Phoenix monument stands today. This column was erected by Lord Chesterfield in 1745. 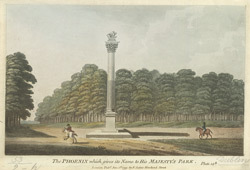 Phoenix park features prominently in James Joyce’s novel ‘Finnegans Wake’, but is known as ‘Fiendish park’.